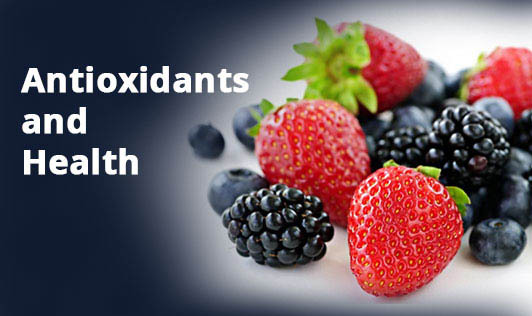 Antioxidants serve to de-act free radicals that are the natural by-products of cell metabolism. They are also created by excessive exposure to environmental pollution, cigarette smoke and radiation. Free radicals can cause damage to certain cell structures and genetic material within the cells. Over a long period, such damage can become irreversible and precipitate heart disease and cancer. To cope with these free radicals, the body needs more antioxidants than it can produce. Vitamins E, C, beta-carotene, selenium, copper, zinc help to neutralize free radicals. Eating a balanced diet rich in brightly coloured fruits and vegetables provides the body with these nutrients. Oxygen Radical Absorbance Capacity (ORAC) is an analysis that measures the total antioxidant power of foods. Foods that score high in ORAC may protect cells and their components from oxidative damage. Numerous studies show that eating plenty of high ORAC fruits and vegetables may help slow the processes associated with ageing and other related diseases. Some high ORAC foods are: Prunes, Kale, Raisins, Spinach, Blueberries, Brussels sprouts, Blackberries, Alfalfa sprouts, Strawberries, Raspberries, Broccoli flowers, Plums, Red bell pepper, Oranges, Onions, Red grapes, Corn, Cherries, Egg plant, Kiwi fruit and Grapefruit.